Hot on the heels of our recent journal club article ‘cut or push’1 on the management of traumatic cardiac arrest 2 comes this paper from our friends and colleagues in the UK. My conflict of interest is that I know and hugely respect most of the authors on this paper. I recently had chance to briefly chat with the very wise Ed Barnard and Jason Smith and I go back years to my time with the Army. In particular I’d like to single out David Yates who was the first Professor of Emergency Medicine in the UK, and under whom I worked at Hope Hospital back in the 1990s (see footnote). So, a couple of weeks ago Rich Carden blogged on the US paper that showed no benefit on open cardiac massage vs closed in patients in traumatic cardiac arrest. We were not convinced that this was definitive and so have not changed practice. This week another paper in resuscitation has been tweeted as saying the same, which would be in contradiction to what we have taught here at St.Emlyn’s and what is advocated in many trauma systems. 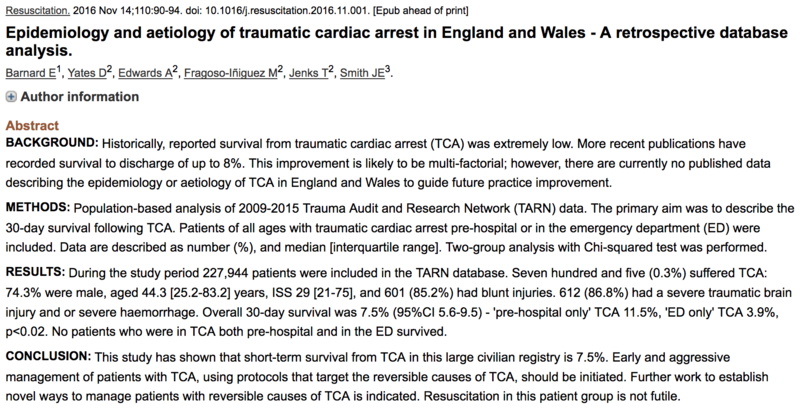 So, here is the paper abstract, Barnard et al on the epidemiology of traumatic cardiac arrest in the UK3. As always please go read the full paper if you can get access. What kind of study is this? It’s a retrospective database study. The authors have looked at the TARN database 4 which is a UK based database on serious trauma. TARN have done some great work over the years and the database has improved greatly from when I did my very first project with them as a medical student back in 1990 (when David Yates was in charge, it’s now run by the fabulous Prof. Fiona Lecky). Data is collected prospectively on all serious trauma from UK hospitals. In the last few years the data collection has improved and it’s pretty comprehensive these days with relatively few patients missed. That was not the case in rthe early days when not all hospitals took part. The period of this study 2009-2015 should be reasonably comprehensive (Ed – see note from Jon Barrett in comments though – TARN does not record those dead at scene and not transported). The authours found 705 patients to analyse over the 6 year period examined. We can take a few interesting points away from this. TCA is rare at 0.3% of patients on the database and the overall survivor rate is 7.5% at 30 days. Most TCAs are a result of blunt trauma (85%), there was no survival difference between blunt and traumatic patients. Many of the patients have head injuries as a cause (86%), others are bleeding patients and some are a mixture (40%) and that’s really quite important. The authors also looked at the influence of chest compressions, endo tracheal intubation, supraglottic airways, thoracotomy, thoracocentesis and the presence of a prehospital doctor. None of these were statistically significant influences on survival. It’s always tricky looking at database studies when the question of causality comes up. On twitter some readers have interpreted the findings as advocating the use of CPR for these patients as there was an association between this and survival but we need to think about that. It has been advocated that CPR is useless or even dangerous in TCA patients and yet this makes us think about this as we should. The question seems to be about what the likely cause of TCA is. In patients who have bled out, those with active bleeding and hypovolaemic shock then there are good arguments not to do CPR5, for those with a head injury or those who had a medical cardiac arrest as a reason for their trauma (e.g. VF whilst driving) then clearly external CPR would be the right thing to do. In other words you need to think about doing CPR and neither always advocate it, or always avoid it in TCA. One clear finding here is that the cause of TCA does not appear to be exsanguination in the majority of patients. Thus strategies that presume this are likely to be incorrect in many circumstances. We may well need different approaches in the patients with exsanguinating causes (e.g. thoracotomy and no CPR) but we can’t presume that for all. It’s interesting to look at the comparable survival rates between blunt and traumatic cardiac arrest. In the past blunt traumatic arrest has been considered by some to be unsurvivable and thus a nihilistic approach has been taken6. These findings should challenge that. At St.Emlyn’s we’ve talked before on the blog and in print about impact brain apnoea 7–10 as a cause of respiratory and cardiac collapse in head injured patients and that may well account for a group of patients who could survive blunt traumatic arrest. Sadly, IBA was not considered in this paper but may account for the excellent neurological outcome in some of the blunt trauma head injury patients identified in this study. The lack of influence of interventions such as thoracotomy is also interesting. In the world of the resuscitationist and pre-hospital care we might expect such interventions to have an influence. In this study they have not, but there are potential reasons for this. Firstly the numbers are small and thus it might be a type 2 error. Also, the influence of interventions such as chest compressions and thoracotomy really rather depend on the cause of the arrest, and that data is not broken down in the paper. At the extreme it’s not appropriate to do a thoracotomy on a patient with an isolated head injury and whilst that’s unlikely we can’t tell from the data presented the appropriateness of interventions. The authors rightly point out in the discussion that we should not really aspire to a one size fits all approach to resuscitation in traumatic cardiac arrest and for me this is the most important take home message from this paper. As a trauma team leader, paramedic or critical care clinician we will continue to make a judgement on the best way to approach and treat our TCA patients based on mechanism of injury, injury patterns and additional information from physical signs (Ed – and USS11). 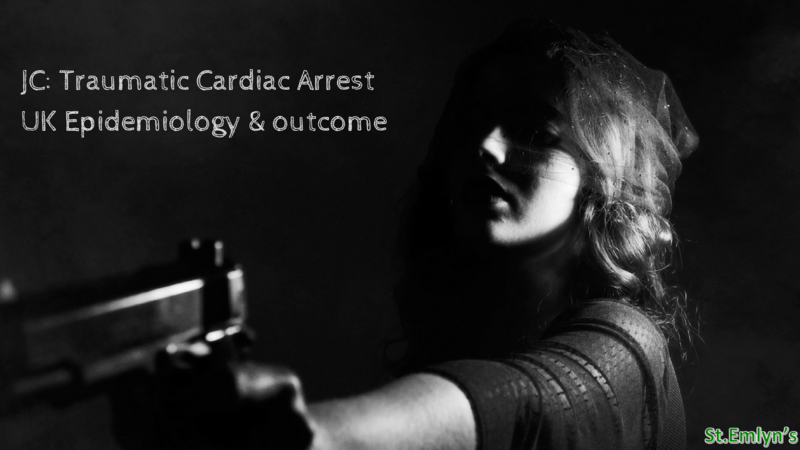 Traumatic cardiac arrest is not a lost cause. The outcome is comparable to medical causes of cardiac arrest12 and we should manage it just as aggressively 13. This paper tells us that we need to think as we resuscitate as there are different mechanisms, injury patterns and thus treatments. On David Yates: An inspirational teacher and researcher in UK EM. David developed EM in Salford, teaching many of those who went to lead the specaility in the military, in the College and in departments all over the world. He was very good to me too. Of note I will never forget him asking me to wait a minute before performing an RSI only for him to whisk back the curtains to reveal 20 med students with the announcement that ‘Dr Carley will now show you how to perform an expert ED RSI’ (I was a mid level trainee at the time). That may seem a little tough through the lens of today, but the truth is that it showed that he had the faith and confidence in his trainees, allowed us to develop our skills and to practice them with safety and support. Cut or Push. St.Emlyn’s. http://www.stemlynsblog.org/jc-push-or-cut-traumatic-cardiac-arrest/. Published November 2016. Accessed November 26, 2016. Apply Some Pressure. St.Emlyn’s. http://www.stemlynsblog.org/traumatic-cardiac-arrest/. Published October 2, 2012. Accessed November 26, 2016. UK TARN. UK TARN. https://www.tarn.ac.uk/. Published 2016. Accessed November 26, 2016. Traumatic Cardiac Arrest. Emcrit. http://emcrit.org/podcasts/traumatic-arrest/. Published 2011. Accessed November 26, 2016. JC: Impact Brain Apnoea. St.Emlyn’s. http://www.stemlynsblog.org/impactbrainapnoea/. Published May 2016. Accessed November 26, 2016. Impact Brain Apnoea. St.Emlyn’s. http://www.stemlynsblog.org/impact-brain-apnoea-gareth-davies-london-hems-st-emlyns/. Published January 2015. Accessed November 26, 2016. Brain Impact Apnoea. Life in the Fast Lane. http://lifeinthefastlane.com/ccc/brain-impact-apnoea/. Published May 2016. Accessed November 26, 2016. Trauma Arrest. ERCAST. http://blog.ercast.org/trauma-arrest/. Published 2013. Accessed November 26, 2016. I agree, once again another fantastic piece of work from Ed Barnard. However there is a limitation to this type of study, something I have been fortunate to be able to discuss with Ed. The TARN database does not include the patients who are “pronounced life extinct” on scene. Whilst a number of these patients will have catastrophic injuries that are immediately recognizable as non survivable, some may be in TCA that is reversible but succumb to their injuries on scene and are not transported to hospital hence don’t enter TARN. There are significant logistical challenges of including these patients in a civilian environment (c.f. Military studies where all casualties were included in a trauma registry) but should this be where we focus our efforts to get the most accurate answer to the question? That’s a really important point Jon. I’ll add that to the post. Based on this UK TARN data patients in traumatic arrest on arrival at the hospital still have the highest mortality possible. When a standby is placed “TCA” and the patient remains in cardiac arrest on arrival the data suggests they have almost no chance of successful resuscitation. Interventions like massive transfusion or thoracotomy should be targeted to patients in TCA on arrival with short pre-hospital downtime –usually those on standby already who loose output en route to hospital. Otherwise we have to manage the expectations of the trauma team and provide support and care for relatives coming to terms with the death of a loved one. Although we have to be careful not to read too much into this paper when considering interventions for those arriving in TCA it does provide encouragement for us when we are resuscitating patients who have an output on arrival in hospital. I agree. In setting where advanced care is not possible at the scene (no PHEM for example) then rapid transport to hospital is the only potential hope. In urban environments the prehospital transport times can be potentially very short. What are your thoughts on acute haemorrhage control + basic airway + get moving in those circumstances? Absolutely. I remember Pete Driscoll wrote a review article around the time I worked at TARN. The evidence for stay and play vs scoop and run for paramedics has always veered towards scoop and run for acute haemorrhage in particular. In the days when comparisons between trauma response from technicians and paramedics were possible it was clear that the paramedic crews did not clearly deliver a survival benefit even when patients were matched on ISS. In hospital with the Trauma team I want to hear that the patient has an output and that they are on their way in without delay. My heart sinks when we get a “just to let you know they will be coming but haven’t left the scene yet” call from ambulance control. My story is purely anecdotal so I am not sure what value it has but I believe that I am a long term survivor of two traumatic cardiac arrests as long ago as October 1973, when I suffered a severe head injury (depressed fractured skull) as a result of being hit by a cattle lorry whilst walking along a main road.I was told subsequently that I had suffered two arrests (presumably in hospital) as well as a grand-mal seizure. I was unconscious three days and my fracture was operated on by a visiting American neurosurgeon. I have subsequently made a full recovery apart from a partially paralysed left arm (due to associated trauma to the left brachial plexus) and occasional myoclonic seizures.